The Wesleyan Methodist congregation in Hollinwood built a chapel in 1841. In 1851 the chapel had about 60 sittings. At their morning and evening services they had 50 worshippers respectively, together with 23 Sunday scholars in the morning and 23 in the afternoon. That original chapel was replaced by the chapel in the photograph in 1898 which was designed by the architect Mr J. Harry Pickard of Whitchurch. 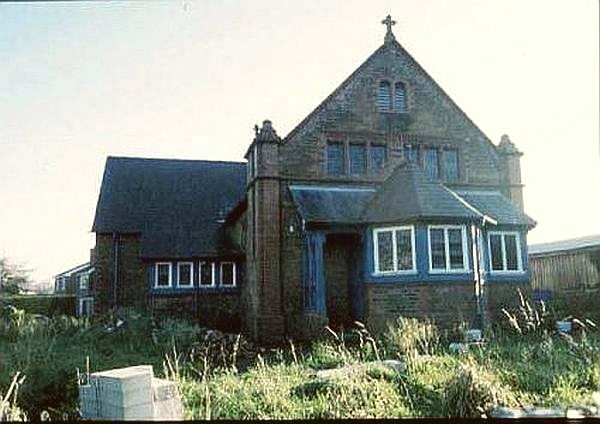 Tenders were invited for the building of the new chapel at Hollinwood on the 8th January and the foundation stones were laid on 23rd February following and the chapel was in use by March 1898. The cost of the chapel building was about £620. The chapel was disused & derelict by the early 21st century. When visited in November 2018 it was still unoccupied & only partly renovated. It has no date stone or denominational stone but there are some stones commemorating the commencement of the building. For a view of the side of the building, click here.